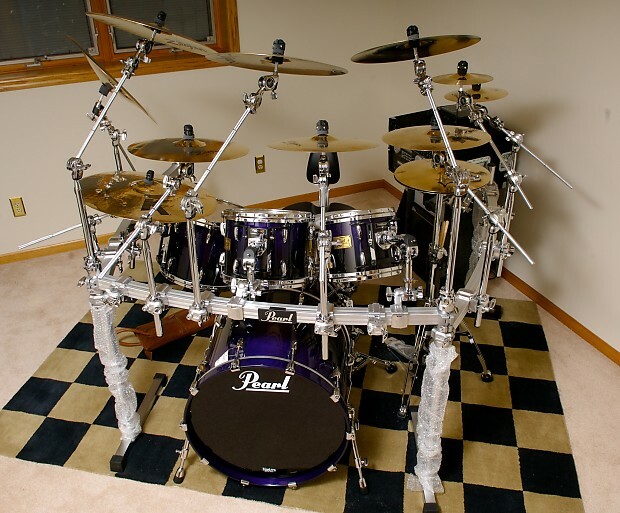 Used Pearl Masters MMX Custom drum Kit, Shells Only. Cymbals and hardware pictured are not included. Storm Blue finish. This is a high end kit with a custom finish that you will not find anywhere else. Yandas Music is committed to getting your order to you as fast as possible. As such we guarantee that your item will be delivered within the promised time frame, or we will refund you shipping charges incurred (if any), and offer you a 15% discount on your next purchase. If you receive your order later than what was promised, let us know by calling toll free at 1-800-338-6939. • Free shipping is only available via UPS standard ground. • Free shipping only applies to shipments delivered to the US lower 48 states. If you live outside this area, you will be charged a minimal shipping charge on your order. • Free shipping is limited to 45 lb. per box. Very large and over-sized packages, such as PA equipment and guitar cabinets, may require additional shipping charges. • Items purchased with a PO (Purchase Order) do not qualify for free shipping. • Lighter weight items, such as guitar strings, may be shipped via USPS and may not contain a tracking number. Yandas offers the following UPS expedited shipping options for in-stock items only. Not all rush shipping options available will be listed during checkout. If you wish to have your item rush shipped via a method not available during checkout, please first contact our orders department here, or call 800-338-6939. We will confirm that the item is eligible for the requested rush shipping method, and give you a quote on the extended cost.